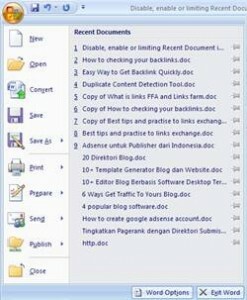 If you click Office button in Microsoft Office 2007, in the right side will be presented recent document. Default Microsoft Office 2007 will show 17 recent documents. Document Recent present all new files of you open. This Facility very if you often open same file. With existence of facility ” pin document” you can open the file from recent document. Sometime this function lessen privacy of user. If you feel annoyed with facility of recent documents, you can limiting recent document or disabling this facility. Click advanced and in the right pane go to display section. If you want to disabe this facility replace the number with zero. If You want to limit presenting document in the recent document, replace the number for example 5. Related to "Disable, enable or limiting Recent Document in Microsoft Office 2007"
What if the Display setting for the Recent Dcoument Number is greyed-out? In other word, the user cannot change the setting because the command is disabled. How do you unblock or enable the command setting?